Hello again! It's the last day of the Lawn Fawn Inspiration Week, and I have a card to share with you today that features the Spanish Scripty Sayings set! 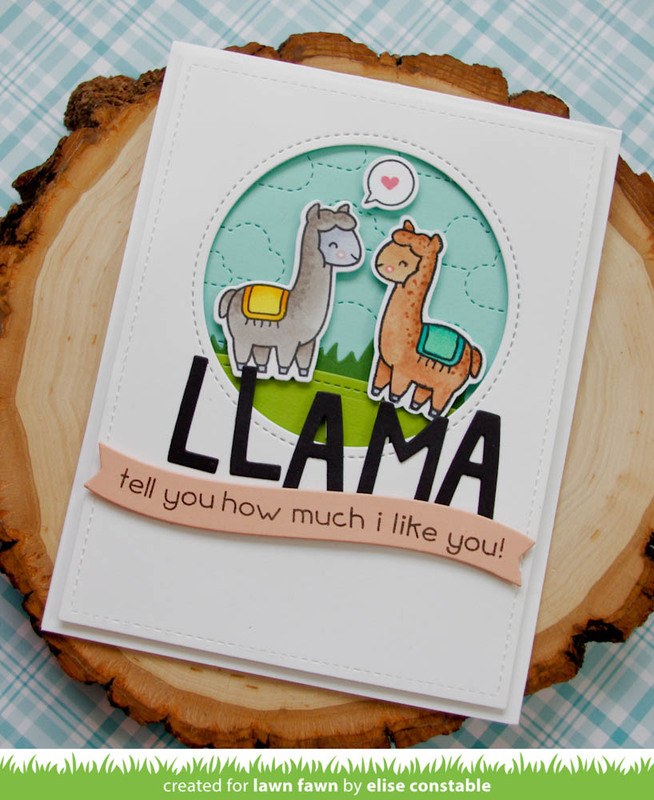 This is such a fun, cheery card and I can't wait to send it to a friend! Good morning! I hope that you are enjoying all of the inspiration this week on the Lawn Fawn blog! 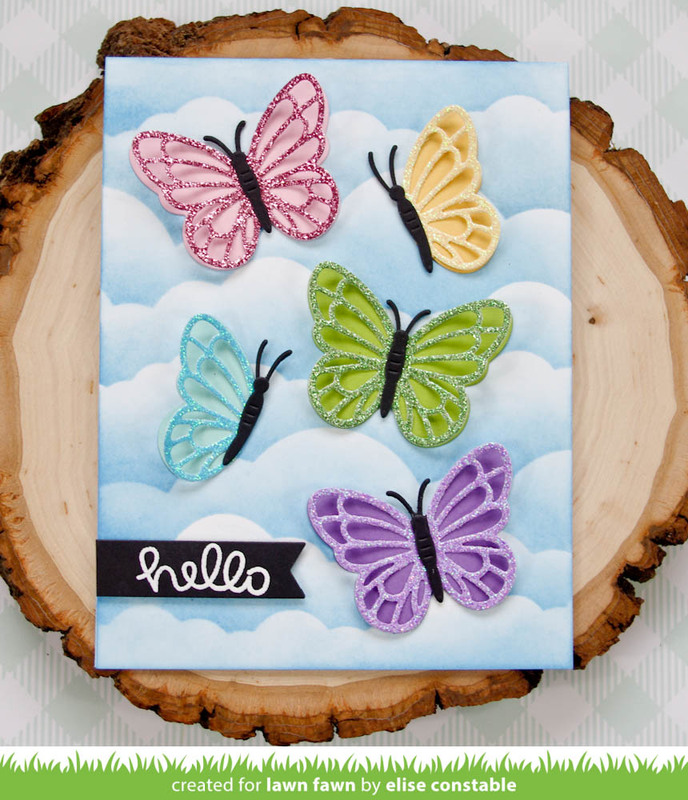 Today, the design team is sharing projects that feature the Layered Butterflies die. These butterflies are so cute! 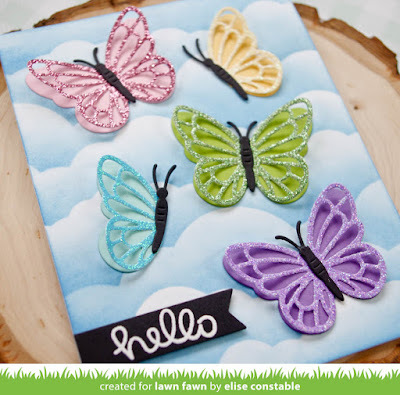 For this card, I used the Spring Sparkle cardstock paired with Ballet Slipper, Sunflower, Freshly Cut Grass, Mermaid, and Sugarplum cardstock to create the butterflies. I also used the Black Licorice cardstock for the butterfly bodies. To create the background, I used the Puffy Cloud borders to create a stencil cut from acetate. I used the stencil and Distress Oxide ink to ink blend a cloudy background. I arranged the butterflies on the sky and glued them in place. 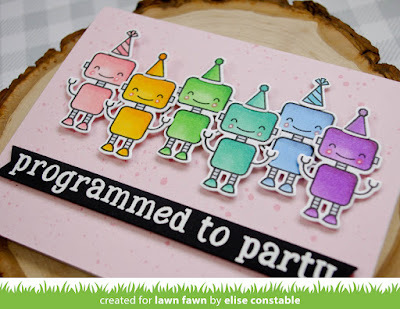 Then, I used a sentiment from the Hello Sunshine set to heat emboss the hello onto black cardstock and die cut with an Everyday Sentiment Banner die. Hi there! I hope you're all having a good week! 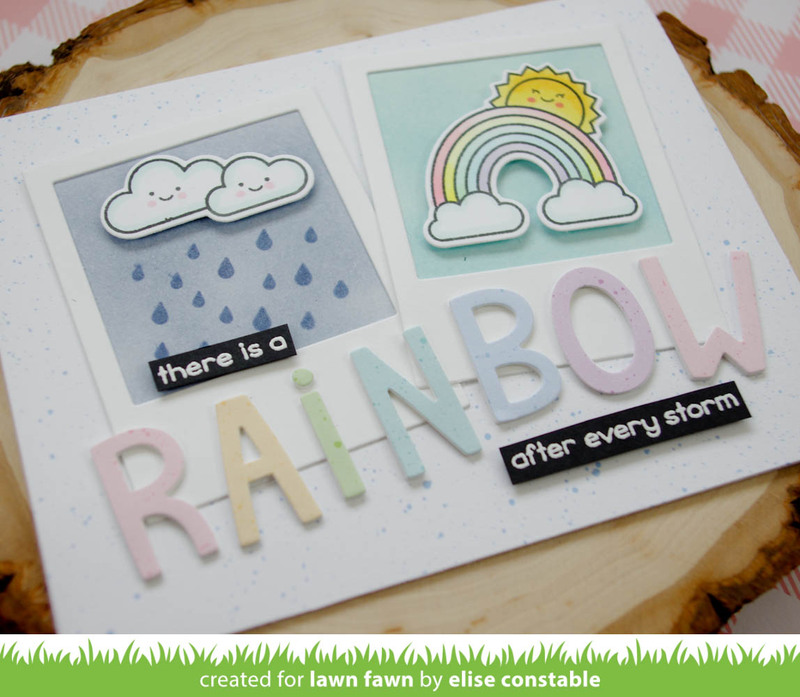 The Lawn Fawn Inspiration Week continues with a look at the Really Rainbow Scallops patterned paper. 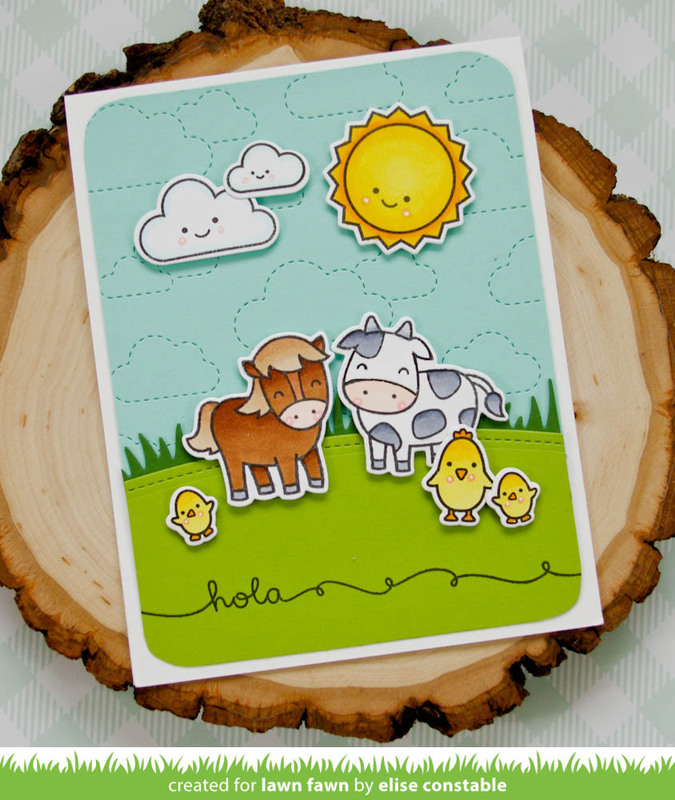 For this card, I used the patterned paper to create a scene! The blue and green patterns are perfect for the sky and grass! I made a 4 1/4" square card and used the Outside In Stitched Square Stackable dies to cut the sky and grass. I also used the Simple Grassy Hillsides die for the grass. The images are all from the Butterfly Kisses set, stamped in Jet Black ink, colored with Copic markers, and die cut with the coordinating die. 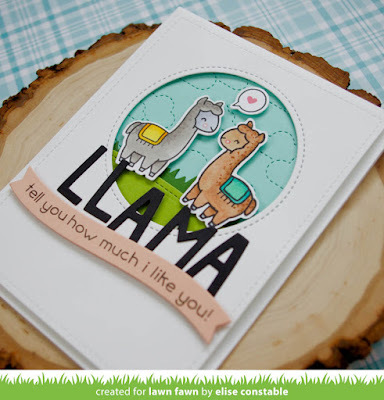 The sentiment is created with Apricot cardstock and the Simple Wavy Banners die. Hi there! The Lawn Fawn Inspiration Week continues today with a look at the Rainy Backdrop dies! 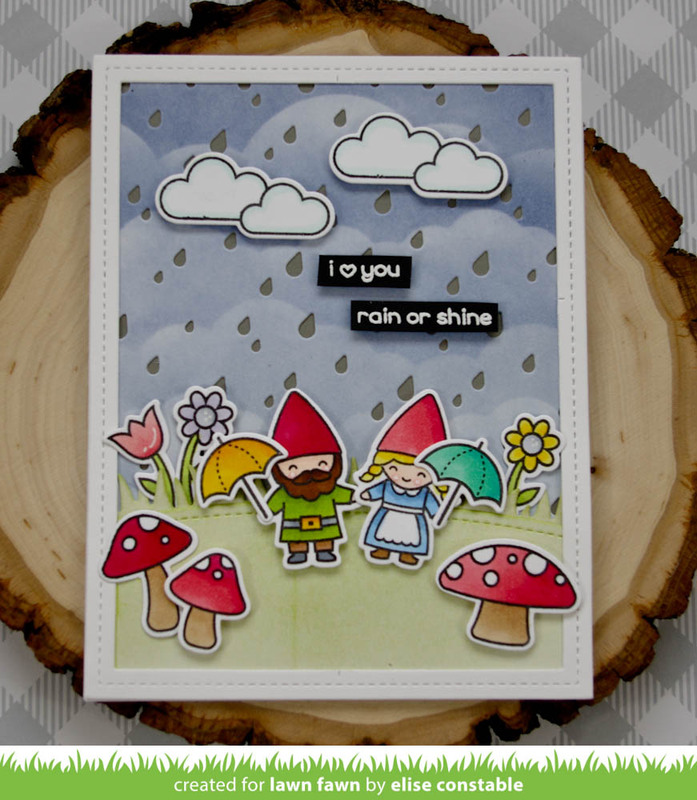 For my card, I used the Puffy Cloud Borders die as a stencil to ink blend a stormy sky with Distress Oxide inks. Then, I used the Rainy Backdrop: Portrait die to die cut the rain drops on the inked cardstock. I layered a piece of Narwhal cardstock behind the background. I die cut a piece of cardstock with the Stitched Hillside Border and ink blended it with light green ink. 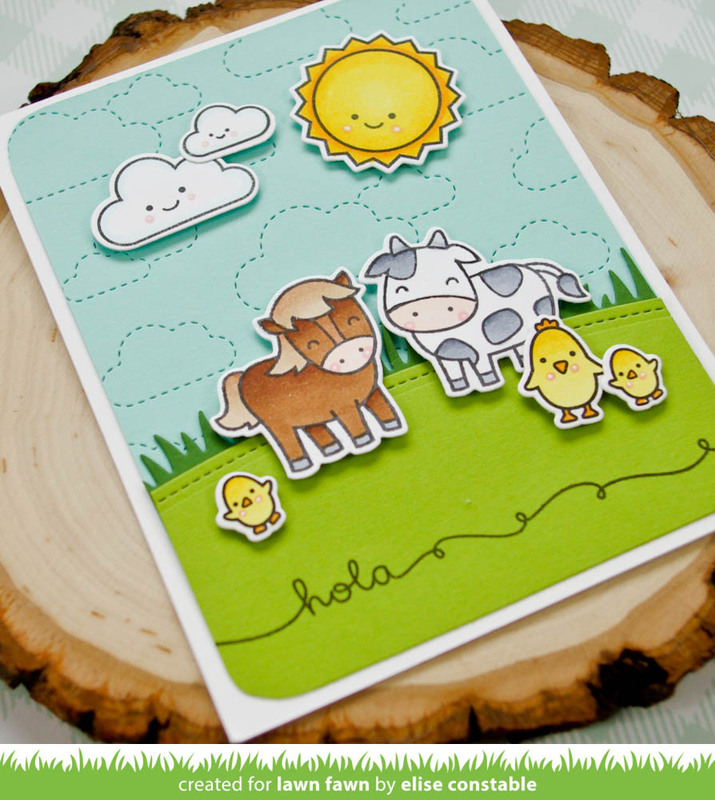 Behind it, I layered another piece of cardstock cut with the Simple Grassy Hillsides die. I die cut a piece of white cardstock from the Peekaboo Backdrop die, cut out the inside frames, and attached it around the scene. Then, I used the images from the Oh, Gnome! set to create the scene. All of the images are colored with Copic markers and most of them are attached with foam tape. Good morning everyone! 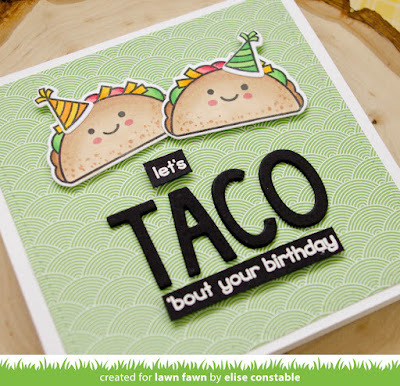 I'm back again today to share a few cards with you for the Lawn Fawn Inspiration Week! My first card features the Year Nine stamp set. How cute are those tacos?! The tacos are stamped in black ink and colored with Copic markers. 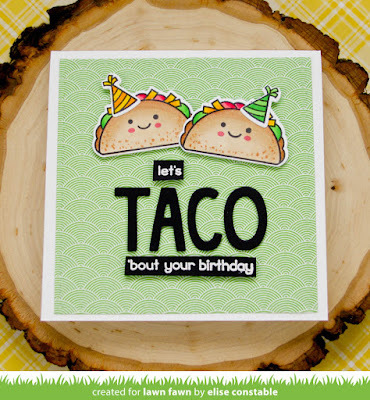 I added a birthday hat onto each of the tacos so that they can celebrate! For the sentiment, I used Finley's ABC's die cut from black cardstock to make a big, bold sentiment. The rest of the sentiment is included in the Year Nine stamp set. I arranged the tacos and sentiment onto a piece of Spiffy Speckles patterned paper and attached it to a 4 1/2" square card base. My next card features the Llama Tell You stamp set. I mirror stamped the llama so that there could be two llamas looking at each other! The sentiment is a combination of Finley's ABC's cut from black cardstock and a Simple Wavy Banner cut from Apricot cardstock. 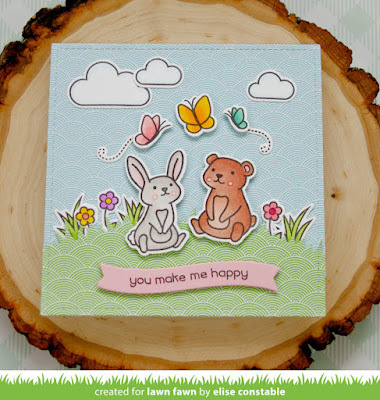 Check out the Lawn Fawn blog for more inspiration featuring these two stamp sets. Hi everyone! I've been quiet on my blog and social media accounts lately as we adjust to being a family of five, but I'm excited to have cards to share with you for the Lawn Fawn Inspiration Week! 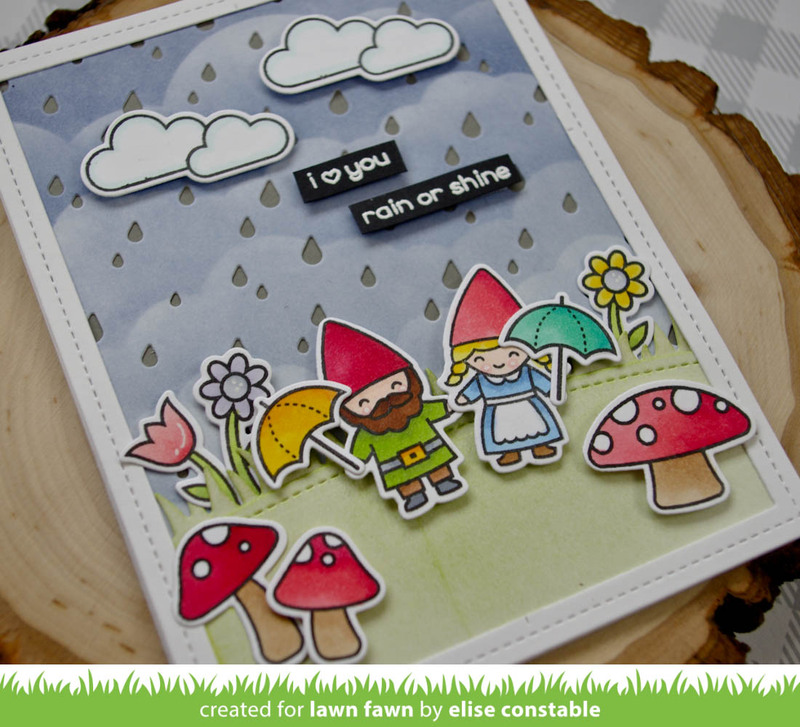 Today, the design team is sharing projects that feature the Rain or Shine Before N' Afters stamp set. This set pairs really well with the Magic Picture Changer die, but it can also be used by itself! I used the Selfie Frames die cut from white cardstock to create a small scene for the rainy clouds and the rainbow. The backgrounds of the scenes are inked with Distress Oxide inks and I attached the clouds and rainbow with foam tape. I attached the frames to a piece of Spiffy Speckles patterned paper which was then attached to a 4 1/4 x 5 1/2 card base. I really like how this card turned out! 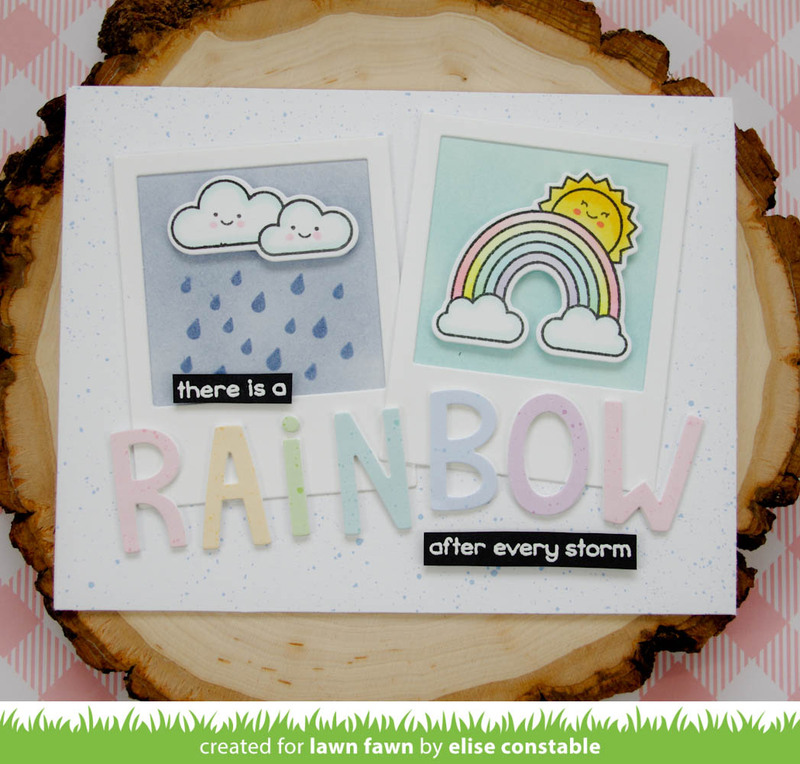 It's so cute with that rainbow sentiment! Hi everyone! I hope that you're all having a good week so far! The weather has been so nice here this week! My kids have had a blast playing outside all afternoon and I have enjoyed that they are all tuckered out for bedtime, haha! 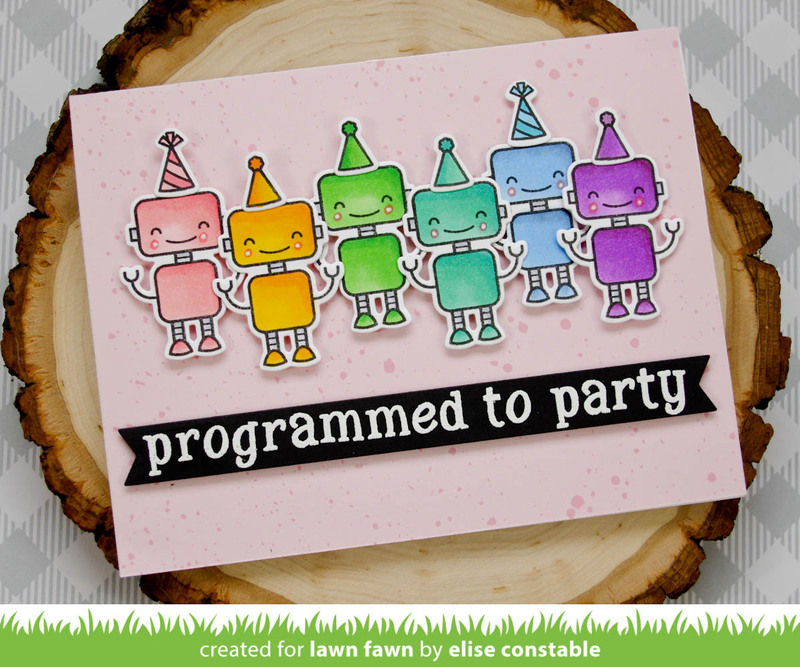 Lawn Fawn and Chibitronics have collaborated together to create an exclusive card making kit! It includes an exclusive mini stamp set, coordinating die, lights, template, and easy-to-follow instructions. This limited kit is already sold out at Lawn Fawn, but there are still kits available in the Chibitronics store. Purchase your kit before it sells out! Stop by the Lawn Fawn and Chibitronics blog for more inspiration using this fun set! And enter the giveaway on the Lawn Fawn blog for your chance to win this limited and exclusive set! Hello! I love God, my awesome husband, my two young children who I get to stay at home with, and crafting! Thanks for visiting my blog today! All content, including text, photos, and designs are ©Whimsipost. Designs are for inspiration and personal use only and may not be copied without permission.